Frankie Ruiz has been the head coach at Belen Jesuit Prep for 16 years dating back to 2002. Over that time his squads have compiled eight state championships and two runner-up finishes. Their most recent cross country championship came at the 2017 state meet. Coach Ruiz talks about the season and the Wolverines journey back to the top. 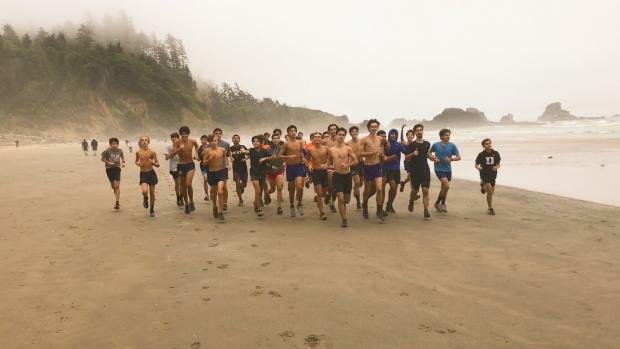 What kind of training did your team do leading up to state? Our physical training leading into State was slightly modified from our training these past few years. We adjusted accordingly due to the kind of progress we experience during the season. The philosophy behind our training carefully evolved but the underlying themes remained the same. We focused on training as a fast controlled pack and easing into a slightly increased training volume rather than a decrease as State approached. The high intensity sessions of our training were more spaced out than in some of our previous seasons. We spent more time refining details and monitoring the progress of the bigger vision. The youthful nature of this year's Top 10 allowed for us to plant seeds early in our summer and build upon that foundation from race to race. Our approach to Josh's training was also slightly different as his veteran status allowed us to infuse his weekly mileage with some more progressive single session long runs. What chances or belief did you have in your team's chance and ability to make the podium? From my perspective their chances were as good as any other team despite what the rankings would show. Naturally I had my doubtful moments after some less than stellar workouts or the several incidents of sickness and injury as late as the week of State. These head scratching moments were quickly reversed by this team. Their near perfect immersion in the belief for the process and even its missteps along the way gave me the confidence to reflect the same back right at them as November approached. What advice or points of emphasis did you give your team prior to the race or the week leading into the state meet? We directed much of our advice on the mental fortitude and focus that the state meet was to require of them. I mainly instructed them to follow every single piece of our well thought out plan and that if they did so our experience allows us to draw a conservative assumption that we would be in the hunt for the title. I reminded them how far we had come not just this past summer and season but for several years now. What was the game plan for state and how do you feel your team executed it? The race plan was for us to do what we had been practicing at our workouts. This was to work the pack into proper pace and placement. Be obsessed over the tightness of our pack and intelligent with the initial pace adjustments. They executed this plan very well. Nothing they controlled was left up to chance. They knew they were to respect the other teams but to focus on doing together what they had worked so hard at doing workout session after workout session. 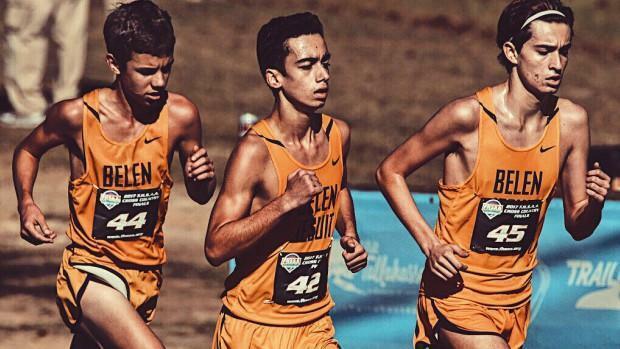 Who do you feel really stepped up individually the most for the team at the state meet? Every single ONE of them. Beginning with one of our most consistent top runners Josh Collins. What were the biggest challenges for this year's team? The usual challenges for a team existed in this year's team. Sickness, injury, school work, Miami distractions... etc. The one single somewhat unique challenge was shared by so many other teams in the State and that was Hurricane Irma. I would be remiss not to point out that these guys used that challenge as building point rather than as an excuse. Were there any low points in the season? How did the team bounce back? There were several low points, the most impactful one was certainly the disruption that Hurricane Irna caused. The team just embraced the chaos and took the opportunity to work harder and rest more. Was there a particular race, workout, or moment that you knew that your team was ready or had the potential to become state champions? Yes, right after Districts. I can say that after their performance at the District Championships at Larry & Penny I was a confident believer in the potency of this 2017 Belen XC Team. How would you best describe the group of kids that you coach? These guys are united and entrenched on doing whatever they can to work hard. They like to race together as a pack and I get fired up when I see them do that. Sadly, I won't get to coach the graduating seniors next year but they left their mark on the program and the group that says behind will benefit from their contributions. I have enjoyed coaching this team and I look forward to watching them build on their successes. They like to race together as a pack and I like to watch them race that way. What role do your assistant coaches play with the program? Without them our program wouldn't be what it is. I can't do all things I think I am good at for the kids without their help doing the things I am not as good at. They offer the near perfect balance to the program. I don't see them as assistants, I see them as equals. In fact, they coached a couple of races without me even being there. I don't work at the school so getting to workouts can be tough at times and my coaches always find a way to fill in when I can't be there. I thank my coaching staff for constantly reminding me how good these guys were and how great they were going to become. The kids I think would agree that we couldn't do what we do and what we have done without the entire coaching staff. What would be the best way to describe your coaching style? I choose to drive unity, team motivation and mental training via our workouts. If the workouts don't accomplish both mental and physical gains I limit their inclusion in our system. I believe in evolving our training programs while retaining a sense of functional tradition. Who were the leaders on your team and what was the importance to the squad? The leadership is shared under my system and this team was no different in that regard. Josh most certainly led by example and the younger guys complemented that with the contribution to the overall optimistic flow of the team's energy with their follow and their words. Last year we had only one Senior, however, this year we certainly felt the positive presence of the 8 seniors on the team. Who was the biggest individual surprise or runner that most impressed you with their improvements this year? Mathew Bryan. I knew he was good runner but I didn't realize how reliable he was going to become so quickly. How would this team rank against some of the past teams that you coached? I don't like to rank my teams because I think they all are special in their own time. All I can say is that I enjoyed watching these guys race and I was fired up with the way they worked out together between those races. Every state championship/podium team seems to have a special or unique makeup that makes them state champions. What were some of those characteristics of this year's team? The characteristics that stood out for me was their belief in each other. They didn't mind what the rankings did or didn't believe about their outlook. Sure they paid attention to that stuff, I mean that's part of the fun. Lets face it it's a great entertaining reason to visit a site site like flrunners.com! The team soaked that stuff and put it to work for them. They certainly savored in challenges on and off of the course and that made them special. 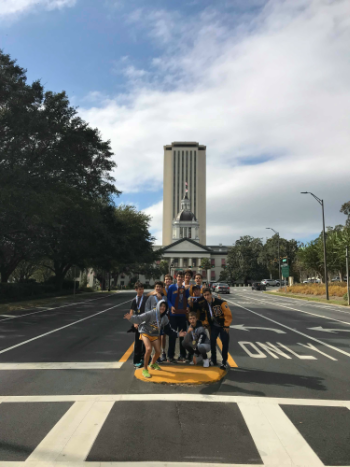 This team also managed to harness the energy of over 40 runners that made up the 2017 squad which the shear chaos of that number can sometimes detract from the objective of a State Title. They used all the tools each and every runner made available to achieve their objectives from JV to Varsity. What are your expectations for next year's team? 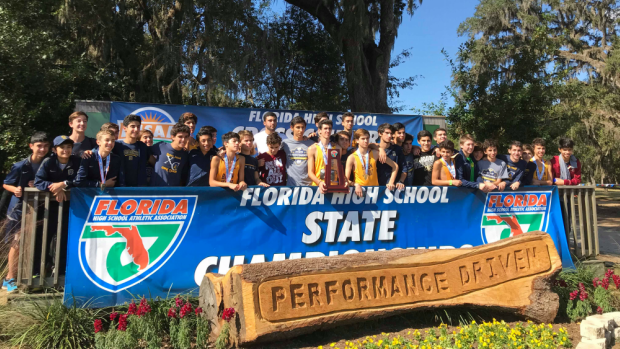 We can only expect them to work hard through track season, then have a solid summer training and a productive regular season so that they can put themselves in a position to be a top contender at the State Meet.